Hong Kong’s bid to become a smart city got a jolt with the opening of the Science City Digital Hub. Jointly launched by Hong Kong Science and Technology Parks Corp. (HKSTP) and Siemens Ltd. (Siemens), it aims to promote collaboration between technology providers and Smart City developers creating solutions for the Hong Kong SAR market. The Science City Digital Hub is designed as an open laboratory and located at the Hong Kong Science Park. It will feature a Smart Mobility Test Bed and Smart Energy Laboratory where startups and infrastructure providers can quickly research and develop solutions. Key supported areas of focus include data analytics, Internet of Things (IoT), connectivity, smart building, smart energy and smart portfolio. “The partnership with Siemens signifies another key milestone for our relentless effort to promote the development of smart city solutions. As an active connector to create a vibrant innovation and technology ecosystem, we have multiple smart city initiatives, such as Smart Region in collaboration with the Chinese University of Hong Kong, to facilitate knowledge transfer and technology commercialization through better collaboration among academia, start-ups, SMEs and global enterprises,” Albert Wong, Chief Executive Officer of HKSTP said in a press release. Siemens MindSphere, a cloud-based IoT operating system, will power the Hub. It will support development in five areas, including City Performance Tool Air (CyPT Air), Connected City Solutions (CCS), Cyber Security, Data Analytics Suitcase, MindSphere Open IoT Platform. “By leveraging Siemens' cloud-based IoT platform and big data capabilities at Science Park's Data Studio, we target to accelerate the development of smart city-related digital analytics applications in Hong Kong and effectively tackle city challenges,” Wong added. The research and development at the Hub will be solely focused on Smart City solutions for the Hong Kong SAR market. The goal is to tackle real-world city challenges in traffic congestion, public safety, energy saving and city planning. 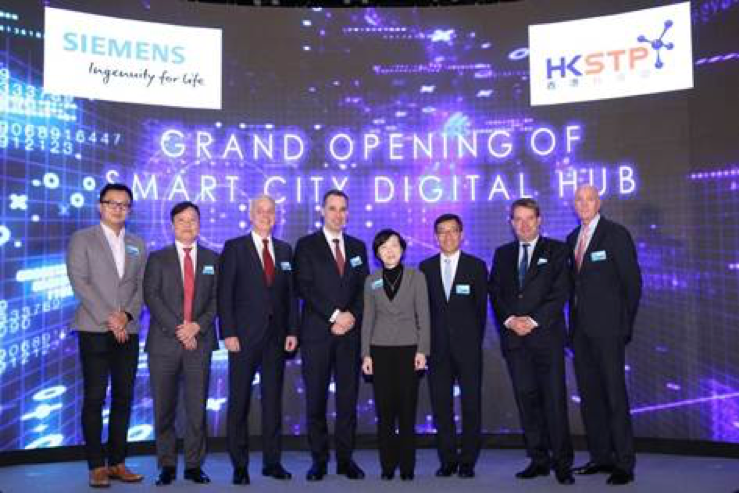 "To drive and contribute to Hong Kong becoming a smart city and digital center, Siemens is taking a new role to jointly develop the first Smart City Digital Hub in Hong Kong with HKSTP,” Cedrik Neike, Member of the Managing Board, Siemens AG said at the opening ceremony. By partnering with HKSTP, Siemens is looking to strengthen their collaboration with their strategic partners, while becoming “a focal point” for startups. “We are very keen to collaborate with our strategic partners like Smart City Consortium, MTR and CLP to pave the way for smart city’s development and shape the future landscape of an innovative ecosystem here and in the region,” Neike added. Fanny Law, Chairperson of HKSTP (4th from R), Albert Wong, CEO of HKSTP (3rd from R), Cedrik Neike, Member of the Managing Board of Siemens AG (4th from L), Lothar Herrmann, CEO, Siemens Greater China (3rd from L), and Eric Chong, President and CEO of Siemens Ltd (2nd from L) kick off the Smart City Digital Hub in Hong Kong Science Park.